Help CentreUsing SuperControl Configuring my propertyHow do I add/edit discounts? 1. To set up a discount, go to Properties > Edit > select property > Discounts > Go. In this page you will see all of the different discounts that are available. They are: Late Availability, Multiple week, Low occupancy, Seasonal, X for the price of Y, and an Early booking discount. You don’t need to set up all of these discounts, just pick and choose which ones work best for you. Please note: You can have multiple discounts running at the same time, whilst choosing to "Only allow one discount". If you tick this option at the top of the page then only the highest value discount will be applied to the booking. Prices will automatically be discounted if the dates are not let within the specified number of days. Leave at zero if not required. Click the "Add discount date range" button to add a new date range. AGENCY users can also select to either deduct the discount from the customer's price or from the owner payment. Percentage off days within specified range: In this example, discount is set at 15%, 14 days prior to arrival. The guest books a week 10 days prior to arrival. Does the guest get 15% off the whole booking or 15% off the days included in the date range? Four of the days the guest will get a discount and the other three will be at full price. Percentage off entire booking: This would give the customer the full 15% discount for the entire booking. Only apply to full week prices: Tick if you want to apply your late availability discount to full week bookings only (not short breaks). Select this option to offer a discount if someone books multiple weeks. For example when someone books 14 nights they will get a discount off their second week. Advanced Options: In here you can set the discount given to be more specific, for example if you would like to discount stays that are not only full week bookings. Multiple week discount enables you to promote longer stays. The actual discount will be shown to the customer rather than the percentage. Leave at zero or blank if not required. Please enter the numbers with no % sign. Include infants: By default the low occupancy discount will apply to adults and children but will not apply to infants. Tick the box if you would like infants to count towards the occupancy for the purpose of calculating this discount. Perpetual: The low occupancy discount applies to any length of stay. Tick the Perpetual box if you wish to offer a low occupancy discount all year round. Selecting "Perpetual" will clear any other discount ranges when saved and will apply all year round. Min/Max nights: You can specify a minimum and maximum number of nights to apply the Low occupancy discount. Discount percentage: These are fields for the number of guests your property sleeps. Enter the percentage discount that you will offer each size of party. For example, if you offer 20% discount for parties of 1-2 people you would enter 20 in the 1 guest field, and 20 in the 2 guests field and leave all other fields at zero or blank. If you wish to specify a booking date period that the guest also has to book between in order to receive the discount, tick this box and enter your date range. If left unticked the booking date is ignored. Discount type: Select "Percentage" to give the customer a percentage discount. Select "Fixed amount" to give the customer a fixed sum for their discount regardless of length of stay. Days given (X): Enter the number of days that you are offering. Days paid (Y): Enter the number of days that the customer needs to pay. Select this option to offer a discount if someone books far in advance - if someone books today to arrive next year, you can give them an Early booking discount. This discount allows you to set it up either by entering the number of days before arrival, or by setting up a date range. For Early booking discount you could do a mailing to your customers to broadcast the offer. From the date range you can show when holidays may be taken to secure the discount e.g. holidays between 4 January and 1 July, and holidays between 30 August and 20 December will be eligible for this discount. No discount is offered during summer holidays or festive season. Minimum/maximum nights: You can specify a minimum/maximum number of nights to which the discount will apply. provide explanation of your discounts. Leave this blank if not required. You can view changes you have made to your discount notes by clicking the green icon with the curved arrow. This will open a log of past changes showing the date, time, and user who saved the changes. Discount notes do still display for non API users – the text will display within the discounts tab under the availability calendars and also in the book now pop up window. Select site: If you have more than one website set up in your account you can select the website from this drop down box. Select language: Multiple languages are only relevant to SuperControl API users. 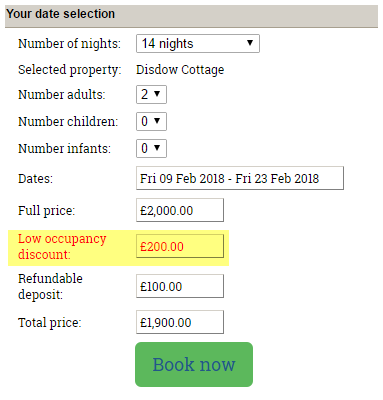 When a discount has been set up, it will display to the guest when they have selected the dates on the calendar on your website. You guest will also see the discount above "Book now". Prev: How do I set up map pins? Next: How do I add property groups?